Great Brickhill made a winning return to Cherwell Division 1 with a 77-run win over Challow & Childrey. On a superb day for cricket, Brickhill posted 242-9, with captain Doug Aris top scoring with 70 and continuing his fine form from the end of last season. Jilesh Pattni and Austin John opened up with solid 30s and Garth Davson chipped in with 39 to put together a strong all round team batting display. 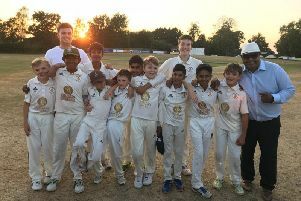 In response, Challow were dismissed for 165 in 40 overs as Brickhill chipped away at the innings, taking wickets regularly and preventing the visitors from building partnerships and momentum. Garth Davson led the bowling with a commendable 4-41. Next week, Brickhill travel to Cumnor. It wasn’t such a fine start for Great Brickhill 2nds though as they were beaten in a closely fought match at Banbury 3rds. Winning the toss, Brickhill worked hard to restrict Banbury to 164-5 in their allotted 50 overs, led by a stand-out performance with the ball from Jack Woodhouse, whose ten overs featured eight maidens and went for four runs. Brickhill fell 30 runs short despite an excellent 50 from Chris Jones. Great Brickhill 3rds lost in quick order to Lidlington CC, posting a disappointing 72 all out on a Stoke Hammond wicket that offered considerable assistance to the visiting seamers. Andrew Robson offered solid resistance, with 25 runs including a thunderous 6, while the emerging and highly talented Dylan Cilliers was unlucky to be left stranded as the innings collapsed. Lidlington chased the target down for 4 down off 26 overs. GBCC Sunday 1st lost a competitive fixture at Ickwell on Sunday. On a stunning afternoon at this most scenic of grounds, Ickwell won the toss and elected to bat, a decision that proved important as the visitors toiled in the heat. Brickhill bowled tidily in spells, with James Wagg (0-27) and James Aldridge (2-53) looking dangerous early on, but the middle overs proved costly as the shine left the ball and it was left to Iqbal John to lead the fight back with a superb 4-26 that saw the home side dismissed for 216. Nimesh Cavda made a big contribution in the field, taking a wicket and two catches, including an almost unbelievable grab at mid wicket. While 216 looked no better than a par score, Ickwell’s opening bowlers wreaked havoc, reducing Brickhill to 36 for 5 before Iqbal John (63) and Dylan Cillers (16) led a second spirited fight back that had Brickhill in contention for an unlikely win. A further flurry of wickets put paid to Brickhill’s resistance, however, and the visitors folded 70 runs short. Rotten Row was bathed in sunshine for the first competitive Sunday League game of the season and the match was watched by many enjoying the wonderful Bank Holiday weather. Brickhill II’s won the toss and elected to field. After a solid start, Bedford II’s were restricted to 167 off 35 overs. Adam Hanley was the pick of the bowlers with 5 wickets on his Sunday debut for a credible 41 runs. Captain Gary Phillips was ably supported with wickets from Jonny Waters (1), John Boyd (1), Tom Wilkes (1) and Chris Wagg (2). In reply, Brickhill fell short of the run chase by 16 with top scores from Luke Lathwell (36), Waters (24), Phillips (20) and Hanley also impressing with the bat with 19. A losing start with but some impressive performances which gives hope for the season ahead.